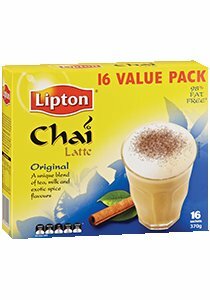 LIPTON Chai Latte is a unique taste experience. It combines tea with exotic spice flavours such as cinnamon, cardamom and ginger with a delicious, creamy milk base. Just add hot water to enjoy a frothy latte style pick-me-up. Also available in packs of 8 sachets. Serving per package: 16. Serving size: 23 g dry contents that makes 250 ml prepared product.